After the unveiling at City Hall. 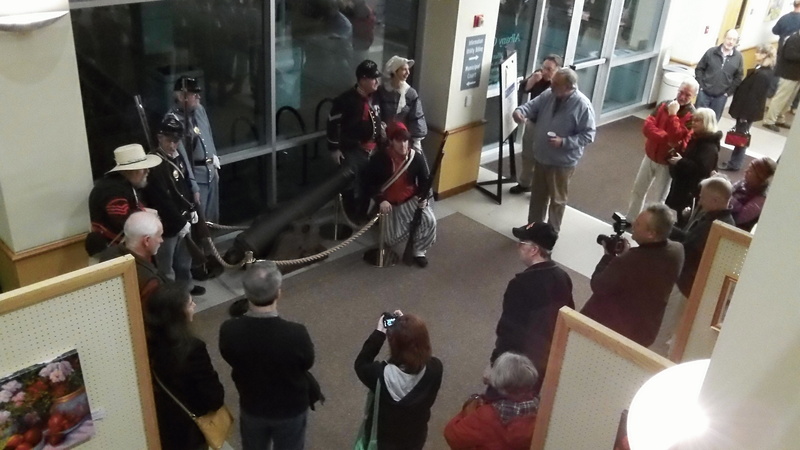 Russ Tripp was on hand to unveil the Albany cannon. If you want to see an old cannon, corroded but loaded with history, stop by the Albany City Hall and take a look. Technically it’s a carronade, and the Monteith Historical Society has acquired it because of its role in Albany’s history. In the lobby of City Hall, about 100 people watched on Wednesday as it was unveiled. Originally the carronade apparently had been mounted on a boat on the Willamette River. By the early years of the Civil War, it had found a home in Albany and was fired by local Republicans to celebrate Union victories in the war. This might have irked parties who favored the other side. In any case, the carronade was stolen in 1863 and dumped into the river, the Monteith Society says. In the river is where it remained for 70 years, until Albany Sand & Gravel Co. dredged it up in 1933. Eventually it was moved to the Albany Post Office (later the city hall and now a private building.) There, Councilman Bill Coburn says he was told, someone once put in some powder and filled the barrel with paper and all kinds of junk and touched it off, splattering the Montgomery Ward store across the street. In any case, the carronade was fired officially to mark Oregon’s centennial. After 1959, though, the thing ended up in the hands of a private party in Lebanon. The Monteith Society, named after two of Albany’s founders, heard in 2011 that it was for sale and began raising funds. Total cost of the cannon was $15,000, paid by the Monteith Society with funds donated for the cause, Hult says. Albany’s Tripp family came through with much of the money in memory of the late Rodney Tripp, a longtime champion of Albany and its history. 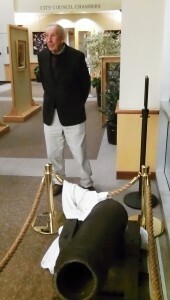 His brother, Russ Tripp, did the honors Wednesday and unveiled the cannon display. Steve Bryant sent this reaction on Facebook: I often heard stories about this cannon during the 31 years I worked for the city. It’s wonderful to see it returned to City Hall. Thanks to Russ Tripp and the others who made it happen! Thank you for pointing out it is a carronade. I will take your word for that. As a fan of the O’Brien books, Aubrey frequently discusses the battle uses for long range cannons and short range carronades, but I have not seen one or the other in real life. The difference between the two influences the fighting tactics and chases and battles. Splattering the Montgomery Ward building with junk seems to be somehow appropriate for a carronade. It’s a minor point, as both seem to be cannons of a type, but I appreciate the accuracy in the reporting. Well, to be perfectly candid, I took somebody word for it too.